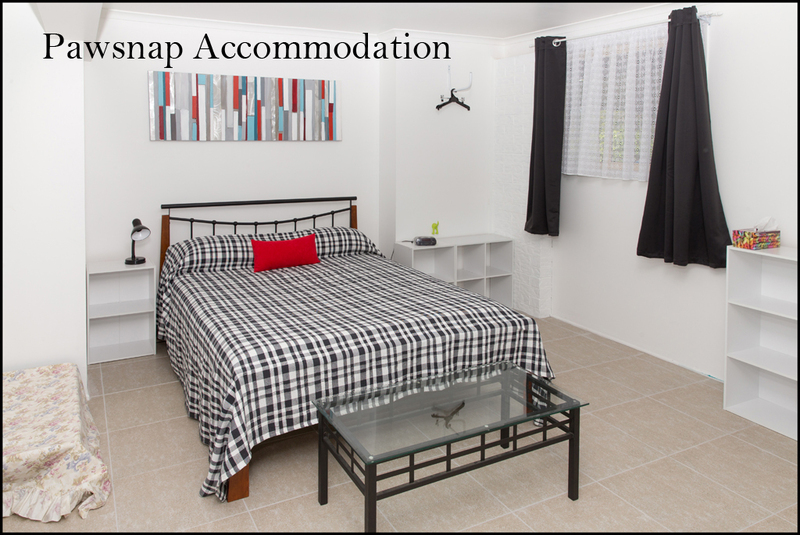 Pawsnap Accommodation is a roomy studio unit in my home, located in North Ipswich (not far from south/westside Brisbane). Suitable for attending a show/trial at Durack, or just travelling with your pets. There is plenty of room for you and your pets, with floor space for crates. The studio unit is fully self contained with kitchenette, queen bed and a couch that folds down into a single bed. Separate bathroom and toilet, and reverse cycle air conditioning. There is a dog bed in the corner for your dog's comfort, but there is plenty of room if you prefer to use your crates. The emphasis has been on keeping plenty of floor space for the dogs and creating a spacious feel. The bathroom and toilet are on the smaller side, but this means more room in the living/sleeping area. ​Apart from a microwave, there is a benchtop single hotplate and a benchtop oven available. My home and yard is a non-smoking environment. My backyard is very small, suitable for toileting only, but there are dog parks close by if you wish to run your dogs. IDOC and ADCQ 5 minutes. Ipswich Greyhound Club and Showground 8 minutes. I reply to all requests within 24 hours, please check your spam bin if you have not received a reply within that time frame. Please make sure you read my terms and conditions so that you know if my unit will be suitable.